Theremin Explorer is a new app by Theremin World member ILYA that helps designers model LC tank circuits, the heart of traditional analog theremins. In the circuit, an inductor (L) and capacitor (C) are joined in parallel. When voltage is applied to the circuit, the capacitor charges up. Eventually, the capacitor will reach it's maximum charge and will begin to discharge. As it discharges, the current decreases, but the inductor resists this change in current and begins to charge the capacitor again, but in the opposite direction. This back and forth continues at a fixed frequency known as the circuit's "resonant frequency". Don't worry if this description doesn't make any sense; you can learn more about LC tanks from helpful videos such as this groovy declassified 1974 Air Force training video. 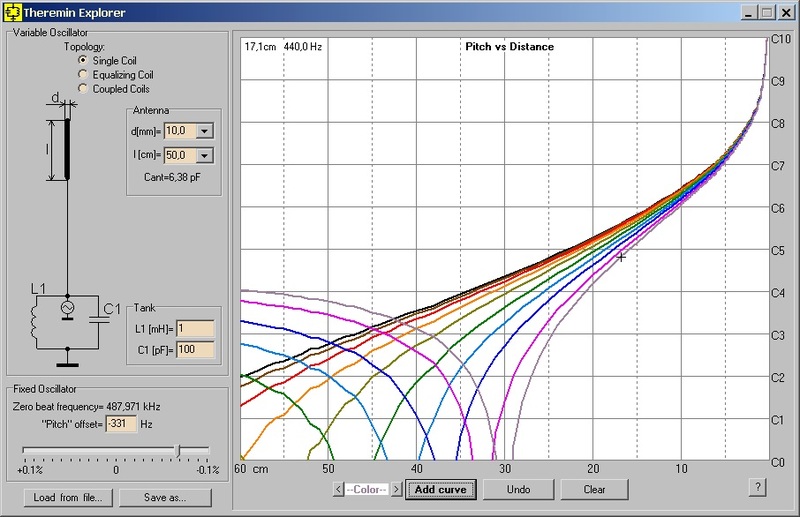 In addition to the L and C values, Theremin Explorer allows you to model other aspects of the theremin circuit such as various coil topologies and antenna length and thickness. Theremin Explorer works on Windows (XP and up) and can be downloaded here (English translation).